Police are looking for more witnesses who may have seen the driver on the highway before the crash took place Wednesday afternoon on the Everett Turnpike at the Bedford toll plaza. 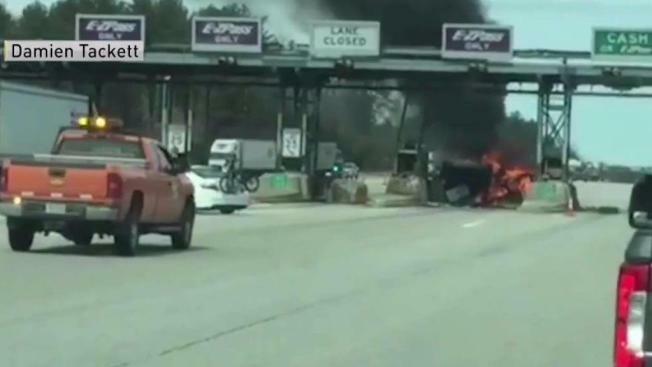 One person was killed when a truck crashed into an E-ZPass tollbooth on a major New Hampshire highway on Wednesday afternoon and burst into flames. The crash occurred after 1 p.m. on the Everett Turnpike at the Bedford toll plaza, shutting down the northbound side of the highway for nearly two hours. The two left lanes reopened around 3 p.m.
Aerial footage from NBC10 Boston's Sky Ranger helicopter showed the burned wreckage of a vehicle lying in front of the tollbooth. The tollbooth was also damaged, with a side panel and speed limit sign lying in the rubble. Ground video supplied by a passing motorist showed the vehicle in flames shortly after the accident with black smoke pouring from the toll plaza. 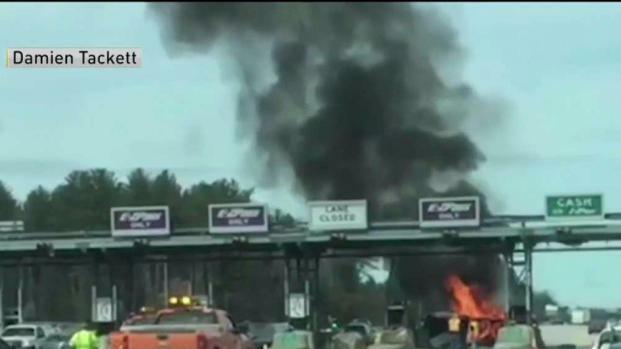 A car crashed into a New Hampshire toll booth, bursting into flames and leaving one person dead. "We don't have any reports of any odd behavior before the crash. Just that the crash happened," New Hampshire State Police Sgt. Bryan Trask said. "It appears the subject was trying to change lanes right before they entered the toll plaza and didn't make the lane quite clear and crashed into the jersey barrier." After hitting the center divider, he said the the truck rolled over at least once, landing between two unmanned E-ZPass lanes. There were people working in adjacent tollbooths at the time but they were not injured. It isn't yet known how fast the vehicle was traveling, but from the damage, Trask said he would guess that it was going pretty fast. "It removed part of the concrete barrier right out of the toll plaza," he said. "I've never seen that happen." Trask said police are still working to identify the vehicle and the person inside, and asked anyone who witnessed the crash to come forward. Damien Tackett recorded video of a car that caught fire after crashing at a toll plaza on the Everett Turnpike in Bedford, New Hampshire. One person was killed. "At this time everything remains open to investigation," he said. "We don't know why it happened, how it happened or who it happened with." Police are also looking for more witnesses who may have seen the driver on the highway before the crash took place. An autopsy has been scheduled for 9 a.m. on Thursday.